It now has been two years since Czech Republic’s Michala Kvapilova made the switch from the indoor game to the beach. 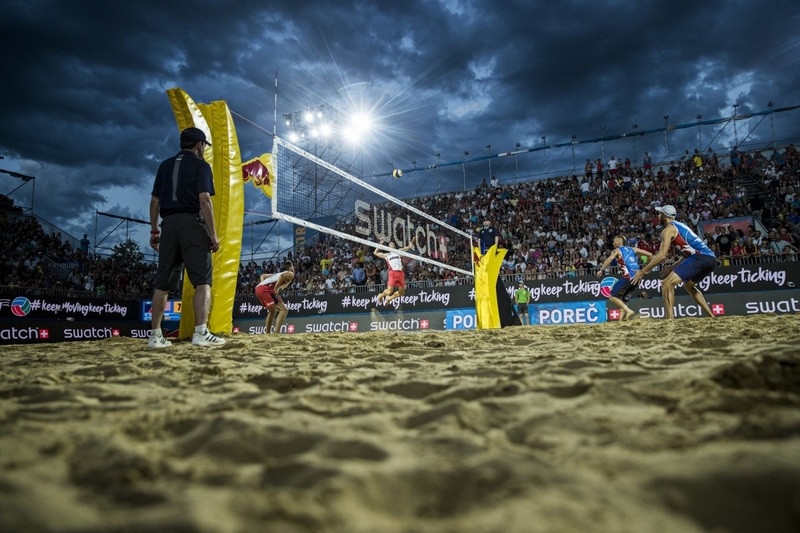 The FIVB and CEV have announced their decision to merge their beach programs – the FIVB World Tour and the CEV European Circuit starting in April. The decision to merge the two beach tours came after the FIVB and CEV‘s success in their cooperation with the Snow Volleyball Night at the PyeongChang 2018 Winter Olympic Games. Starting in April, all CEV Satellite events will turn into a World Tour 1-star tournament, becoming an open tournament to beach players from around the world. CEV Masters events will be converted into the World Tour as 2-star tournaments. For the 2018 season, the CEV will be responsible for running all 1-star and 2-star tournaments that take place in Europe. For future seasons, the same concept will be looked at to apply to 3-star tournaments once agreed upon between the two parties. The merge is a huge step for many players as it gives them more opportunities to play internationally but that 1 and 2-star events will count towards qualification for the Tokyo 2020 Olympic Games once the Olympic Qualification period starts. “The FIVB and the CEV have come together to further integrate the international beach volleyball calendar and provide benefits to both athletes and event promoters. Our goal is to continue to grow the sport and the combination of our efforts will help us to achieve that goal,” said FIVB President Dr. Ary S. Graca. More events are still to be confirmed for the switch following negotiations by the CEV with a number of European National Federations. With the addition of the 5 CEV events, the total number of World Tour tournaments moves up to nearly 50 with more tournaments still being discussed. This season the European Championship Final is set to take place in the Netherlands from July 15-22. The event will remain a stand-alone event with exclusive participation of European players. The 2018 edition of the event will take place across from cites – The Hague, Rotterdam, Apeldoorn and Utrecht. 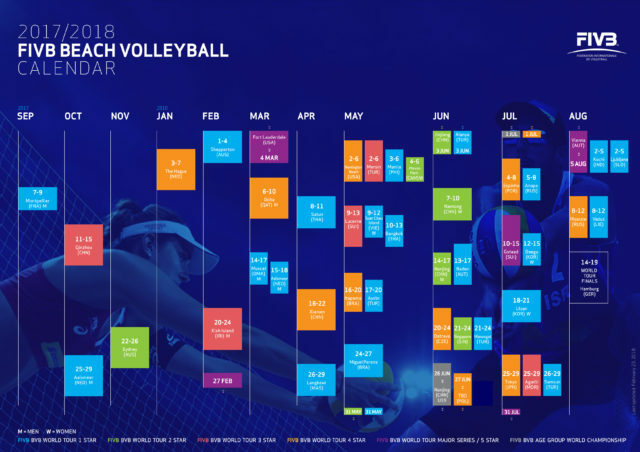 The FIVB is also working with other Confederations around the globe to potentially merge together to create a more powerful product to market, with more competitive entry lists and a better understanding of the global event structure. A new stop in Asia has been added to the calendar – Phnom Penh, Cambodia, a 2-star women’s event from May 4-6. An additional event in Asia is still being discussed in Haiyang, China in the second half of July. An event that was to take place in Monaco in June has been canceled due to construction work on the beach. The next stop on the tour will be the first 5-star event of the season at the Fort Lauderdale Major that will take place from February 27-March 4.